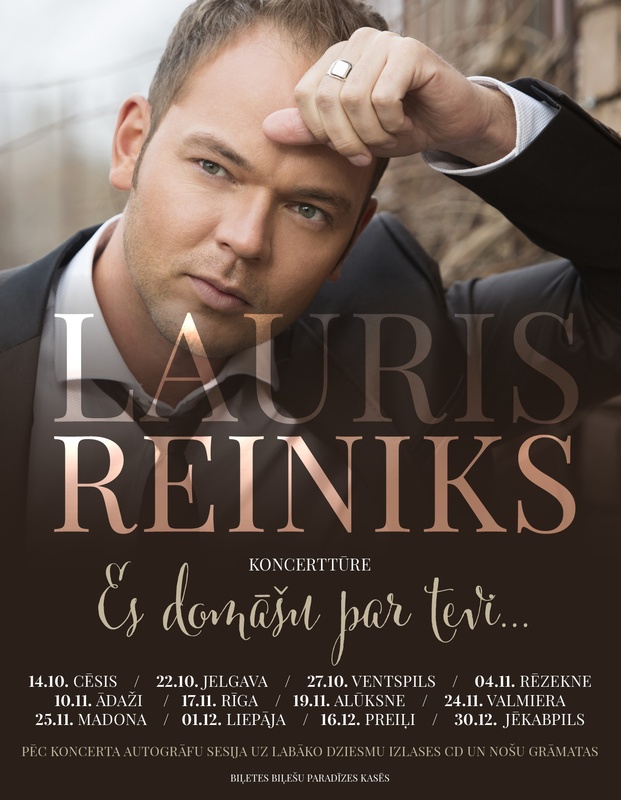 In October Lauris Reiniks is starting his big Latvian concert tour with a show in Cesis city. The tour is titled “Es domāšu par tevi” (I will think about you) and will cover 12 cities in Latvia. During last five years, Lauris has visited his fans in Latvia not very often and what makes this tour even more special is a release of Lauris Reiniks song book and compilation album of Lauris best songs. The tour kicks off in Cesis on October 14, 2017 and will continue in Jelgava, Ventspils, Rezekne, Adazi, Aluksne, Valmiera, Madona, Liepaja, Jekabpils and Preili. The grand Riga show will take place on November 17 at Congress House, the day before Latvia’s Independence day celebration. “What gives me inspiration and strength for this tour is the idea that you have to give and leave something valuable to your people. Especially when they still wait for it. Latvia’s 100th Anniversary is approaching. It is very nice to realise that I will enter it with my tour, book with sheet music for 50 of my songs and a compilation album of 20 most popular songs in my career. It will be like a present to our country”, tells Lauris.